A rare delight in the new car market is a car that works brilliantly in everything it’s meant to do. No over promising, not pretending to be something it has no right to be and every feature and function working just the way you think it should – no guess work or disappointed grumbling to be had. Most cars feel built to a price and you can find the corners that have been cut once you start living with the car. Very few feel built for a purpose and honed until every element made the cut. The class leading new Volkswagen Tiguan takes the latter approach. It combines the cutting edge in car technology from entertainment to active safety, with the build quality and supreme practicality Volkswagen has developed, honed and perfected over decades of building some of the world’s greatest cars. Volkswagen know what they’re doing, and they’re doing it at their best here. While that might sound like the makings of a potentially dazzling experience only those up to date with the latest and greatest will appreciate, you’d be wrong. Technology is at its best when you notice it when you want to adjust it, the rest of the time it quietly goes about making your life a little better. The Tiguan is a comfortable relaxed drive with plenty of space whichever friends you choose to drive with. Even if it’s just Siri politely directing you along the quickest route home via Apple CarPlay. Two sayings perfectly sum up the Tiguan, “enough is as good as a feast” and “if something is worth doing, it’s worth doing it properly.” The Tiguan includes everything you expect in a properly modern SUV with an options list of ‘nice to haves’ on the side. While the spec sheet might look similar to the competition (although more often than not exceeding them for similar money), the way it all works together certainly sets it apart. Let’s start with the most common area of frustration, the entertainment system. The class leading technological wizardry here is centred on the central 8 inch touch screen. Pairing you phone via Bluetooth is as simple as you always wish it would be, streaming your tunes before you’ve had the chance to think it and harking back to the days when you used to start the car and the radio was automatically on. Technology the way it should be. Voice commands and navigation work similarly seamlessly and free of “what’s it doing now” moments and connecting via USB gives you access to Apple CarPlay and Android auto should that be your preferred cup of tea. 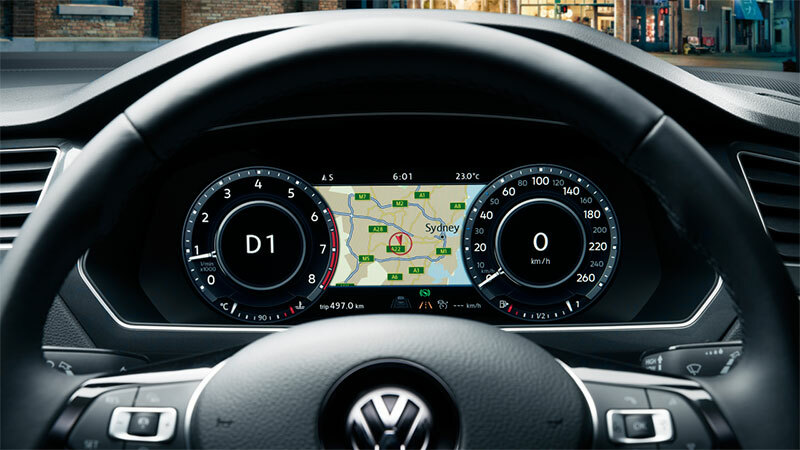 Should you option your Tiguan with the Active info display, instead of the traditional rev counter and speedo you’ll find a large 12.3 inch high def instrument panel which you are able to customise to show the information you want from navigation, infotainment, driver assistance, off-road and vehicle performance functions. Anything you need can be in front of your eyes, letting you know what you need to know without your vision coming off the road longer than it absolutely needs to. Further features can include built in sat-nav if you’d rather not use the Apple CarPlay or Android Auto options, reversing camera, park assist, lane assist, blind spot detection, driver attention monitor, automatic emergency braking, adaptive cruise control. All beautifully integrated and functioning unobtrusively in the background. Look away from the screens and take your mind off technology for a minute and you’ll realise what a nice place the cabin of the Tiguan is to spend time in. Superbly comfortable seats with excellent support including lumbar adjustment for both front occupants is a welcome feature, finished appropriately with a selection of premium fabrics or Vienna leather should the want arise. Everything you touch or see has a prestige and upmarket feel. No disappointing plastics here. Storage is more than ample with an enormous and class leading 615 litre boot space, expandable to 1,655 litres with the seats folded. Back to the front seats, we’ll start with a glovebox which is actually usable, practical places to store mobile phones and wallets, plus cup and bottle holders and a deep storage bin in the centre with a comfortable arm rest doubling as the lid. On top of that, there’s a dash top storage compartment, and if you don’t option a sunroof or panoramic glass roof you’ll also gain two more cubbies in the roof. Rear seat passengers will rejoice, even for larger occupants there is ample knee, leg and head room for three adults across the back. Not only that but they’ll be in comfort with their own climate control zone, perfect for little ones in baby seats too – able to be tethered with two ISOFIX points plus three top tether anchors. A nice and fairly unique feature is the airline style fold down tray tables, making the long drive all the more bearable for back seat passengers, finally somewhere to put that iPad or book down. 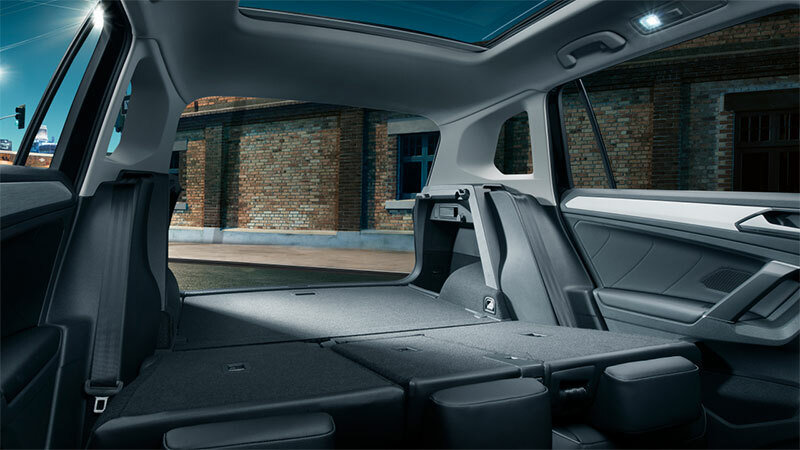 Should the back seat passengers not be on the guest list today, fold the rear seats down and open up a cavernous expanse featuring hooks and tether points letting you keep everything in place, plus a 12v power outlet and more storage compartments. With the choice of petrol and diesel engines in various states of tune you can choose to be an eco-warrior low fuel consumption champion, or you can take the performance route 162tsi option with an engine lifted straight from the legendary Golf GTI. 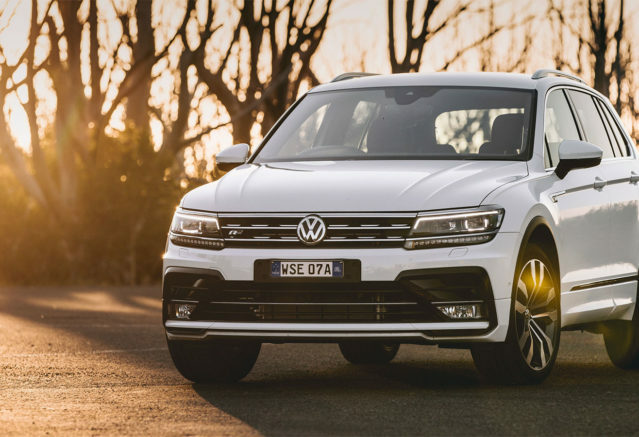 Linked to the 4MOTION all-wheel-drive system with Active Control tailored to your terrain and selectable to your preferred driver profile (normal, sport, eco, comfort or individual) you’ll always be able to set your Tiguan up for whatever task is at hand – be it the daily grind or the long weekend away from it all. A comprehensive range of accessories can be had for the Tiguan as well, allowing you to build yours to your exact needs. Styling kits, alloy wheels, protection packs, roof racks and external storage options, not to mention sun blinds, iPad holders, coat hooks and various other niceties. Spec sheet shopping never tells the full story of a car and we often don’t know what we’re missing out on until we stop missing it out. 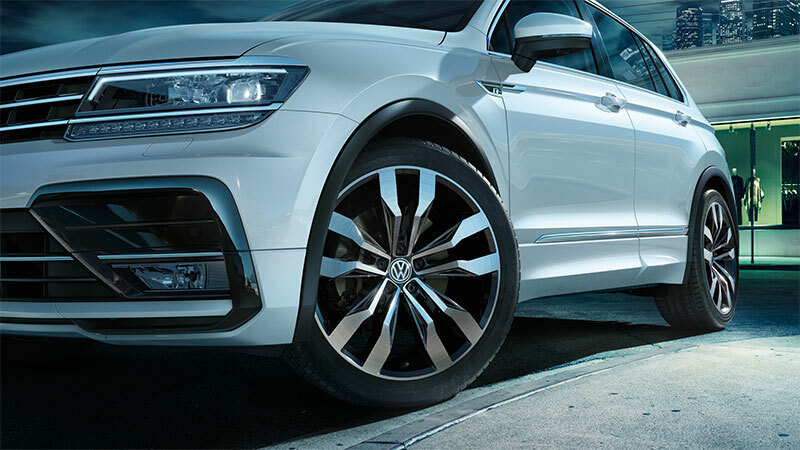 Experience the driving difference today with the new Volkswagen Tiguan at John Hughes Volkswagen, just over the causeway on Shepperton Road in Victoria Park.